Across wide swaths of state government, male employees make more on average than their female colleagues. But a closer look at the payrolls of individual agencies and offices presents a more complicated picture. As the candidates for Texas governor ramped up their attacks this week over wage discrimination and sexism, the hiring practices of the state's public agencies drew new scrutiny. Supporters of state Sen. Wendy Davis have accused Republican Attorney General Greg Abbott of unfairly paying his female lawyers less than their male counterparts. Republicans have countered with questions about how much Davis pays her own Senate staffers. A Texas Tribune analysis of state payroll data shows that across wide swaths of state government, male employees make more on average than their female colleagues. But a closer look at the payrolls of individual agencies and offices — including those of both Abbott and Davis — presents a more complicated picture. The evidence that men make more in government is most striking among the highest-paid workers at the state’s various agencies. Of the 50 highest-paid employees in state government, excluding those at universities, only 12 are female. Davis and her supporters have aggressively pushed equal pay as a campaign issue, tying it to the Texas version of the federal Lilly Ledbetter Fair Pay Act, which Davis passed in the Legislature last year only to watch Gov. Rick Perry veto it. Abbott has said he opposes wage discrimination but would also veto such a bill if he were governor, arguing that enough protections already exist in federal law. The issue of gender pay is a complicated one in which different statistics can offer competing impressions. The Tribune looked at the differences in average and median pay for male and female employees at 54 state agencies with 100 or more employees, excluding universities. In both cases, wages for males came out ahead of females in more than 40 of the 54 agencies. The attorney general's office had the ninth-largest gap between average male and female pay among those state agencies. The average pay for males at the agency is $60,323, and the average pay for females is $44,685. Of the 4,081 employees in the AG's office, 70 percent are female, a larger proportion than nearly every other state agency in Texas. Yet most of the women fall in the bottom half of the agency’s salaries. Only three of the 20 highest-paid employees at the AG’s office are female. Lauren Bean, a spokeswoman for the AG’s office, said the number of female lawyers at the agency has increased by 23 percent since Abbott took over in 2002. The AG’s office provided the Tribune with detailed data on its staff, including when 716 assistant attorneys general were hired and when they were licensed by the state bar of Texas. Yet trying to draw conclusions about how the office pays men and women in relation to experience and seniority is difficult. The AG’s office divides its assistant attorneys general into seven different job categories. In six of those categories, males make more on average. That includes two categories in which female lawyers started working at the agency earlier and have been licensed longer on average. Yet in the one job category in which female assistant attorneys general make more than their male counterparts, the male lawyers have greater seniority and have been licensed for a longer period on average. Bean said the attorneys in the AG's office have a wide range of responsibilities and backgrounds. "Looking at salary averages for a diverse group of attorneys – even if they all share the same job classification – isn’t a useful way of determining whether any individual attorney is fairly paid," she said. Sandra Black, a professor of economics at the University of Texas at Austin who has studied gender pay issues, said that numerous studies have found that women tend to get paid less than men for the same jobs. The extent of that disparity and the reasons for it can be difficult to determine through salary data, she said, but some trends are hard to ignore. “No matter how narrow you get, you can always say there’s something you’re not measuring in the data, that this situation is different," Black said. "But if women that observedly look the same are earning less, or in the case where they look better and they are earning the same, that doesn’t seem like a good situation." In response to Democratic attacks against Abbott's AG payroll, RedState Women, a new PAC, has raised questions about how Davis and other senators pay male and female employees. Davis’ campaign provided the Tribune with her Senate office’s 2013 payroll, which included 12 employees, six men and six women. Women, on average, were paid nearly $3,000 more than men. That’s not far off from the full Senate: Women, on average, make $3,081 more than men, and 11 of the 20 highest-paid workers are female. But earlier this year, Davis’ Senate office shrunk to nine staffers — five females and four males, according to Senate administration records. Her office’s female employees, on average, now make more than $10,000 more than their male colleagues, according to state payroll data. A closer look at gender disparities in other state agencies demonstrates that the issue defies simple explanation. In some cases, the agencies with the widest gaps specialize in the kind of work that has long been dominated by a single gender. At the Texas Department of Transportation, where a large portion of the agency’s workers are engineers and road maintenance workers, women make up just 21 percent of employees. No women are among the agency’s 20 highest-paid employees. 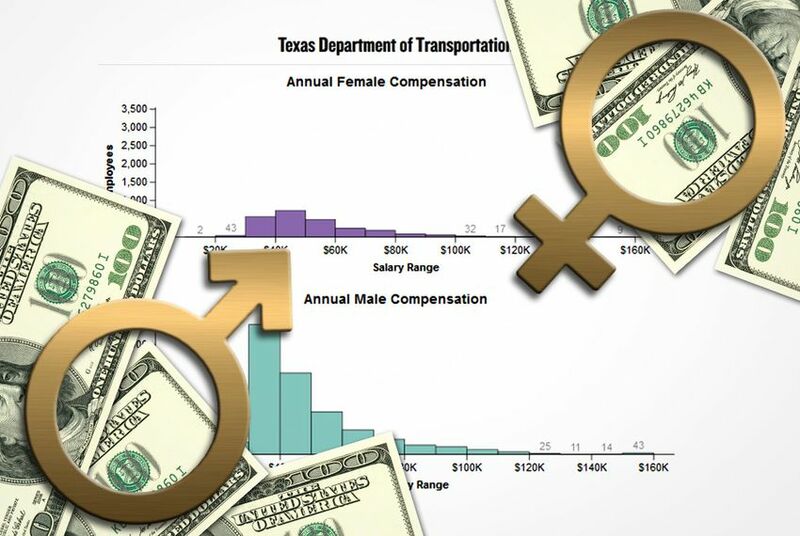 Yet the average female TxDOT employee makes more than $4,000 more than the average male TxDOT employee. TxDOT spokesman Bob Kaufman noted that 21 percent of the agency’s licensed professional engineers are women, well ahead of the national average of 13 percent. “TxDOT is committed to hiring and developing a diverse workforce, one that is dedicated in carrying out the department’s mission and becoming future leaders and decisionmakers of this great agency,” Kaufman said. Heidi Hartmann, president and CEO of the Institute for Women’s Policy Research, said looking at fields like engineering, which have historically drawn more men, can complicate efforts to analyze gender pay issues. While TxDOT is among several agencies that are overwhelmingly male, women represent a majority in other areas of state government. The Department of Family and Protective Services, for instance, is 84 percent female, yet the average male employee makes $3,331 more than the average female employee. A large portion of the agency’s workers have backgrounds in social services, a field that has traditionally drawn more women, Hartmann said. One state office where gender divisions have shifted over time is Perry's, which has seen women take on a majority of the top roles in recent years. The office is 60 percent female, and females are paid $6,382 more on average. Hartmann said Texas has work to do to reduce wage discrimination but that pay disparities could be worse. She pointed to a recent report by the American Association of University Women that showed Texas women earning 79 percent of what men earn, based on census data. While nothing to celebrate, she said, that’s better than the national average, which is 77 percent. “Texas is doing a little better than I thought, which is probably reflecting the fact that it’s an increasingly modern economy, not as heavily dependent on agriculture or mining,” she said.